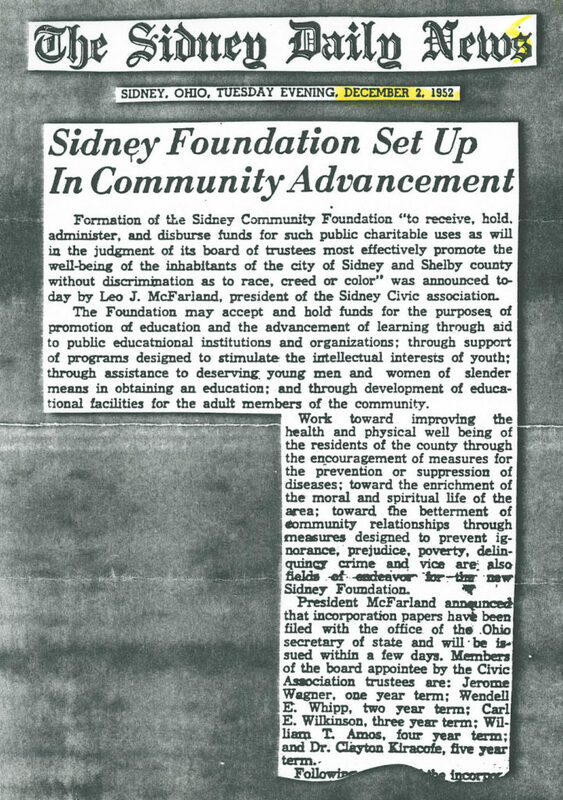 The local organization’s history began in 1952 when the foundation, initially titled the Sidney Community Foundation, was incorporated by prominent Sidney businessmen William Amos, Dr. Clayton Kiracofe, Jerome Wagner, Carl Wilkinson and Wendell Whipp. In 1997, the name was changed to The Community Foundation of Sidney and Shelby County to reflect a broader service area. In 2002, the name was modified to The Community Foundation of Shelby County. The foundation started with a gift of 300 shares of Monarch Machine Tool Company stock valued at $5,136 given by Wendell Whipp, who was the company’s president. Whipp then gave an additional 100 shares of Monarch stock, creating the W.E. Whipp Miscellaneous Fund, a donor advised fund allowing Whipp to recommend grants made from the fund. After Whipp’s death, the fund converted to what was called the General Fund and today is known as the Community Impact Fund. The Foundation received its first gift from outside of the board of trustees from the estate of John Douglas Long. Mr. Long, a retired farmer, died in 1949 entrusting the remaining $8,600 of his estate to executor, Leo Brandewie. Long’s will requested that the sum “aid, comfort, and benefit all persons resident of Shelby County who suffer from blindness or seriously impaired eyesight.” Following the incorporation of The Community Foundation, Brandewie asked foundation trustees to take over the administration of the bequest. Since its inception, the John Douglas Long Blind Fund has given tens of thousands of dollars in eyesight assistance and treatment to local residents. In the 1960’s, just before merging with a regional Girl Scout Council in Lima, the Foundation received the Camp Brookside property, east of Sidney, from the Sidney and Shelby County Girl Scouts, Inc. Local Girl Scout troops continued to use the camp while it was maintained by the Appleseed Ridge Girl Scout Council. In 2009, the Girl Scout Council decided to cease the use of the Camp, so the Community Foundation chose to donate the property to the City of Sidney. Brookside is now connected to the City’s Tawawa Park and is open to residents through walking trails. During a mid-1962 meeting, Foundation president Dr. H.E. Crimm suggested sponsoring an oral polio vaccine program. The Sabin Oral Vaccine Fund was immediately established and quickly collected more than $8,600 in contributions for the public. Two polio immunization clinics, staffed by a number of doctors, nurses, pharmacists and youth and adult civic groups, were well attended by county residents. Several articles and letters of praise were printed in the Sidney Daily News . The Foundation didn’t have a lot of money to be a major contributor to building projects, but it was able to help with feasibility studies for some organizations and capital campaigns. Grants for feasibility studies helped the community establish the Sidney-Shelby County YMCA, the Shelby County Pastoral Counseling Center, the Shelby County Mental Health Clinic, the Shelby County Youth Development Corporation, and the Miami River Corridor Committee. County villages also used the Foundation for specialized charitable funds. The Botkins Community Fund, established in 1969, initially provided grants supporting projects such as the community park and swimming pool, but later transitioned to a scholarship fund. The Jackson Center municipal pool was built in the late 1960’s with money received and disbursed by the Foundation’s Jackson Center Swimming Pool account. After the pool’s construction the Foundation deeded it to the Village of Jackson Center for operation and upkeep. The Foundation made educational loans from its General Fund for the first 24 years of its existence. Then in 1976, a bequest from the estate of long-time teacher Lola Detrick Carmony established the first fund solely for the purpose of scholarships. Community Foundation grants helped local organizations preserve history. A Self-Guided Walking Tour brochure produced by the Chamber of Commerce in 1977 featured line drawings of historic buildings and homes in Sidney and include brief descriptions of the architectural features of each structure. The Foundation also gave a $3,500 grant in 1978 to help the Shelby County Historical Society purchase the former Water Works building on Brooklyn Avenue. The Water Works served as the Historical Society’s home until the group purchased what is now known as the Ross Historical Center. Throughout the 1980’s the Foundation made grants and accepted a few charitable funds. Then in the 1990s, after 40 years of existence, the Foundation began to pick up momentum and charitable funds. With a prosperous stock market creating new wealth, individuals and organizations looked for ways to ease their tax and administrative burden by establishing charitable funds. The Sidney Noon Kiwanis Scholarship Fund, the DEB Fund, the Roscoe Beanblossom Fund, the James Kleinke Scholarship Fund, the William and Bonnie Swonger Scholarship Fund all were established in the early 1990’s. With the new funds came more opportunities for local youths and nonprofits to receive grants from Community Foundation funds. From 1952 to 1998, the Foundation was administered by local attorneys including Leo McFarland, Jack Garmhausen and Eugene Elsass. In 1998, following a strategic planning process involving community leaders, trustees Donald Bensman, Richard Henke, Patrick Milligan, Sandra Shoemaker and Herbert Schlater decided the Foundation needed an office and staff of its own. Marian Spicer was hired as the Executive Director to begin on Jan. 1, 1999 and the office opened in Courtview Center in downtown Sidney. In 2001, other staff positions were added, increasing the capacity and specialization of Foundation work. By 2000, the Foundation administered 29 funds, valued at $3.8 million. The Foundation began assisting with community capital campaigns in 2002 when the Sidney Memorial Stadium Fund was established. Since then, many sports, recreation, arts and community service project funds from throughout Shelby County have been administered at the Foundation. By 2010, the Foundation administered 136 funds valued at $16.4 million. The Foundation continues to grow and innovate. 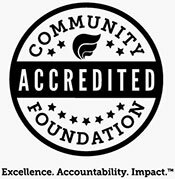 It remains the only community foundation serving Shelby County, Ohio.